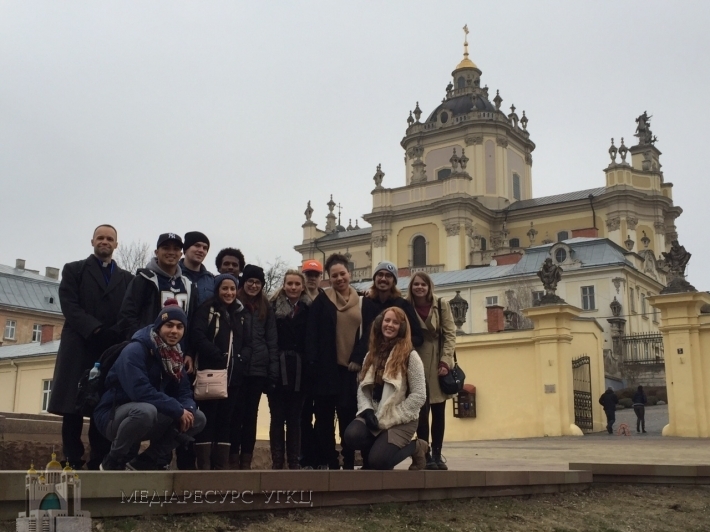 A group of 10 American students from the Jesuit-run Loyola Marymount University were in Lviv for 7 days as part of an immersion program which was oriented at acquainting them with the eastern theological tradition and culture. Joining the students in the visit to UCU was the director of the Huffington Ecumenical Institute of Loyola Marymount University, Prof. Nicholas Denysenko, PhD, Assistant Professor of Theological Studies, and Katie Jones, Communications Specialist of the Liberal Arts Dean’s Office. The trip was organized by UCU’s Faculty of Theology and Philosophy. According to Father Deacon Roman Zaviyskyy, Dean of UCU’s Faculty of Theology and Philosophy, he and Prof. Denysenko had been thinking about the idea of a trip like this since they met two years ago at an international conference at the University of Toronto. “I was invited to the University of Toronto as a representative of the UGCC to give a report on the future of Orthodoxy in Ukraine. I knew of Prof. Denysenko as a world-renowned scholar in liturgical theology. We became personally acquainted and we had the idea as part of a course in the eastern Christian tradition to bring American students to Ukraine so that, with Lviv as an example, they could see how various traditions can co-exist – Orthodox, UGCC, RCC, the Armenian Church, and also other religions – Islam, Judaism, and Christianity. The students took part in interreligious dialogue – they visited an Islamic center, attended a conference on the churches’ role in keeping the peace. They heard reports from Catholic and Protestant theologians,” he recounts. The visit’s program included lectures, excursions to places of worship, and interaction with Ukrainian students. They found out about the university’s mission during a lecture by a Ukrainian defender of human rights, UCU Vice-rector Myroslav Marynovych. Fr. Iwan Dacko, PhD, President of UCU’s Institute of Ecumenical Studies, spoke on “Ecumenism and the UGCC’s role in the ecumenical movement.” Andriy Shkarbyuk led a practicum in liturgical singing and invited them to sing at a Greek-language liturgy celebrated in the chapel of the FTP. At the National Museum the American students participated in a master-class in iconography “Icons on glass,” and each of them was able to try to paint an eastern icon. UCU’s Center for the Study of Modern Foreign Languages organized an English club at which the American students were able to get better acquainted with the Ukrainians, who worked on their fluency. The Americans also ate dinner with UCU theology students, which the student council organized. For the majority of the students from Los Angeles, this was their first time in Ukraine. Some had only heard about Ukraine on the news. But now they know what is happening here, as eyewitnesses. Ashley Schwartz, a marketing major, was a little nervous before the trip. “I’ve never been to Europe. I’ve never left California. I was afraid. I didn’t know what to expect. I only heard about eastern Ukraine on the news. Now you don’t hear anything about western Ukraine on the news. When I came here, I fell in love with Lviv, its history, museums, and people,” she explained. Another student admitted that some people refuse to travel to Ukraine, in particular because of events in the east. “Before my trip to Ukraine they said that this is not the best place to travel to now. But I was interested in seeing what I had only studied in theory. I really liked Lviv’s architecture. I was also delighted with the incredibly friendly, intelligent people. Lviv is a beautiful city with much history and culture, and the coffee here is great. I asked myself many questions about how one can practice Christianity every day. I saw that faith is not simply attending a certain church, not a physical ritual, but something at all times. UCU students are bearers of Christian values and this is incredibly inspiring.” So Whitney Spence shared her impressions. Before the trip to Lviv Prof. Nicholas Denysenko visited Kyiv, where his grandmother is from. After World War II she and her husband immigrated to Germany. In 1953 Nicholas’s parents moved to Chicago. He cares about Ukraine, because his roots are here. “This is my first time in Lviv. I was impressed by people’s hospitality and generosity. People here are very optimistic. UCU is a real witness, ‘living blood’ for Ukrainians and the whole world, which provides energy through its witness, its ministry, its optimism. We were pleased with the quality of the immersion program, which is prepared for international projects,” recounts Denysenko. As part of his visit, the professor took part in an international conference “The churches’ role in keeping the peace: Ecumenical cooperation for society’s harmony and reconciliation,” which took place on March 4 in Lviv. “My report was about the spiritual legacy of the Byzantine church. I spoke about the dialogues between the Orthodox and Catholic churches. The Orthodox Church is more inclined to negative statements about the Catholic Church. People in the diaspora dream that in Ukraine a spiritual rebirth is happening and that mutual fears are disappearing. The church’s mission is to be a sacrifice for the world,” emphasizes Deacon Nicholas Denysenko.